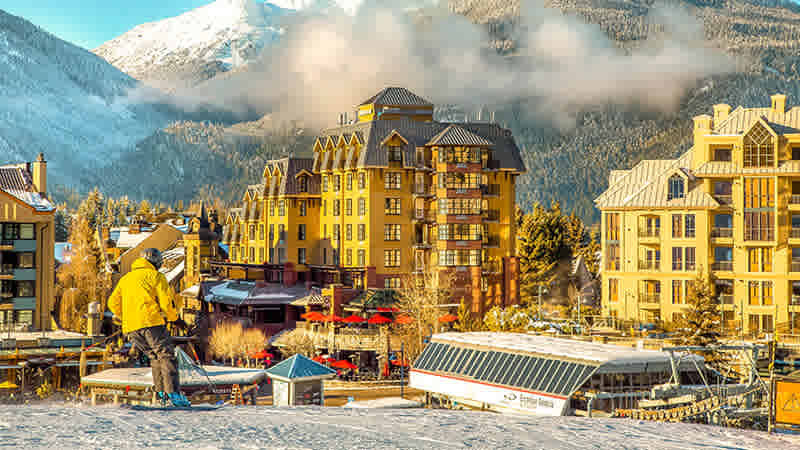 In the heart of Whistler Village, next to the Whistler Blackcomb gondolas, the Sundial Boutique Hotel offers an incomparable location and exemplary personalized service. All 49 luxurious suites feature full kitchens and gas fireplaces, including eight suites with private outdoor hot tubs. Guest suites feature a master bedroom, separate living area with queen sized pull-out sofa, granite countertops, heated slate flooring in each bathroom, AVEDA bath products, luxury linens, Serta Presidential Suite King mattresses, HDTVs and complimentary high-speed wireless Internet. The Sundial Hotel also offers a 10-person shared rooftop hot tub and an outdoor pool in summer (located at the hotel across the street). Restaurants found on site are Sushi Village, Mexican Corner, Black's Original Ristorante and Black's Pub. One Bedroom Valley View Suite: Our impressive One-Bedroom Valley View Suite provides delightful views of Rainbow Mountain and 500 to 619 square feet of comfortable space. The master bedroom offers a unique King-split bed, and the full bath features heated slate flooring, a bathtub and indulgent AVEDA amenities. The separate living room showcases a corner gas fireplace, 50-inch flat screen smart TV with DVD player, and Queen-size sofa bed. The fully-equipped gourmet kitchen comes complete with refrigerator, microwave, dishwasher, stove and all cooking, serving and eating dishes and utensils. This suite is designed to accommodate a maximum of four guests. One Bedroom Mountain View Suite: Our One-Bedroom Mountain View Suite offers impressive views of the Whistler Blackcomb Gondolas and provides 592 to 619 square feet of relaxing space. The master bedroom has a unique King-split bed, and the full bath features heated slate flooring, a bathtub and indulgent AVEDA amenities. The separate living room showcases a corner gas fireplace, 50-inch flat screen smart TV with DVD player, and Queen-size sofa bed. The fully-equipped gourmet kitchen comes complete with refrigerator, microwave, dishwasher, stove and all cooking, serving and eating dishes and utensils. This suite is designed to accommodate a maximum of four guests. One Bedroom Personal Hot Tub Suite: Our One-Bedroom Personal Hot Tub Suite provides an ideal accommodation in Whistler Village featuring your very own hot tub on a personal balcony – a unique feature that offers you incredible views and a one-of-a-kind vacation experience. The suite has 583 to 623 square feet of space with lovely views of the Whistler and Blackcomb Mountains or Village, a master bedroom with a unique King-split bed, and a full bathroom featuring heated slate flooring and indulgent AVEDA amenities. The separate living room showcases a corner gas fireplace, 50-inch flat screen smart TV with DVD player, and Queen-size sofa bed. The fully-equipped gourmet kitchen comes complete with refrigerator, microwave, dishwasher, stove and all cooking, serving and eating dishes and utensils. This incredible suite is designed to accommodate a maximum of four guests for a memorable stay. One Bedroom Deluxe Private Hot Tub Suite: The One-Bedroom Deluxe Private Hot Tub Suite offers you the ultimate Whistler experience with 673 to 921 square feet of exquisite space. Your private balcony with hot tub provides spectacular views of the Whistler and Blackcomb Mountains and the Village stroll, and the gourmet kitchen comes complete with refrigerator, microwave, dishwasher, stove and all cooking, serving and eating dishes and utensils. The master bedroom offers a King-split bed and a full bathroom featuring heated slate flooring and indulgent AVEDA amenities. The separate living room offers a corner gas fireplace, 50-inch flat screen smart TV with DVD player, and Queen-size sofa bed. This luxurious suite is designed to accommodate a maximum of four guests for an unforgettable stay. Two Bedroom Valley View Suite: Our Two-Bedroom Valley View Suite provides the ideal accommodations for families with children or groups of up to six. The suite has 674 square feet of space with scenic views of Rainbow Mountain. The master bedroom offers a unique King-split bed, and the second bedroom features a Queen size bed. Please note, the smaller second bedroom doesnt have a window. The separate living room provides an additional Queen-size sofa bed, a corner gas fireplace and 50-inch flat screen smart TV with DVD player. The full bathroom, accessible from both the master bedroom and the living area, features heated slate flooring and indulgent AVEDA amenities. The fully-equipped gourmet kitchen comes complete with refrigerator, microwave, dishwasher, stove and all cooking, serving and eating dishes and utensils. This luxurious suite is designed to accommodate up to six guests for a memorable stay. Two Bedroom Premium Valley View Suite: Our spacious Two-Bedroom Premium Valley View Suite provides the perfect accommodations for families with children or groups of up to six. The suite has 783 to 879 square feet of space with scenic views of Whistler and the Blackcomb Mountains. The master bedroom offers a unique King-split bed, and the second bedroom features a Queen size bed. Both bedrooms showcase stunning views of Skiers Plaza and have their own 32-inch flat screen televisions. The separate living room provides an additional Queen-size sofa bed, a corner gas fireplace and 50-inch flat screen smart TV with DVD player. The full bathroom features a shower stall, heated slate flooring and AVEDA amenities, while the second bathroom has a shower with AVEDA amenities and a vanity. Please note that there is no toilet in the second bathroom. The fully-equipped gourmet kitchen comes complete with refrigerator, microwave, dishwasher, stove and all cooking, serving and eating dishes and utensils. This indulgent suite is designed to accommodate up to six guests for an utterly incredible stay. Two Bedroom Premium Mountain View Suite: Our welcoming Two-Bedroom Mountain View Suite provides exclusive accommodations for families with children or groups of up to six. The suite has 786 to 804 square feet of comfortable space with breathtaking views of Whistler and the Blackcomb Mountains. The master bedroom offers a unique King-split bed, and the second bedroom features a Queen size bed. Both bedrooms showcase stunning views of Skiers Plaza and have their own 32-inch flat screen televisions. The separate living room provides an additional Queen-size sofa bed, a corner gas fireplace and 50-inch flat screen smart TV with DVD player. The full bathroom features a shower stall, heated slate flooring and AVEDA amenities, while the second bathroom has a shower with AVEDA amenities and a vanity. Please note that there is no toilet in the second bathroom. The fully-equipped gourmet kitchen comes complete with refrigerator, microwave, dishwasher, stove and all cooking, serving and eating dishes and utensils. This indulgent suite is designed to accommodate up to six guests for an utterly incredible stay. Two Bedroom Personal Hot Tub Suite: For the penultimate luxury experience, our Two-Bedroom Personal Hot Tub Suite provides indulgent accommodations for families with children or groups of up to six. The suite has 748 to 822 square feet of space showcasing views of Whistler and the Blackcomb Mountains. The master bedroom offers a unique King-split bed, and the second bedroom features a Queen size bed. Both bedrooms showcase stunning views of Skiers Plaza and have their own 32-inch flat screen televisions. The separate living room provides an additional Queen-size sofa bed, a corner gas fireplace and 50-inch flat screen smart TV with DVD player. The full bathroom features a shower stall, heated slate flooring and AVEDA amenities, while the second bathroom has a shower with AVEDA amenities and a vanity. Please note that there is no toilet in the second bathroom. The fully-equipped gourmet kitchen comes complete with refrigerator, microwave, dishwasher, stove and all cooking, serving and eating dishes and utensils. This luxurious suite is designed to accommodate up to six guests for an unforgettable stay.